Happy Mother’s Day to all of the mothers out there! There are plenty of ways to celebrate Mom with jazz this weekend, including a couple events ahead of the holiday. 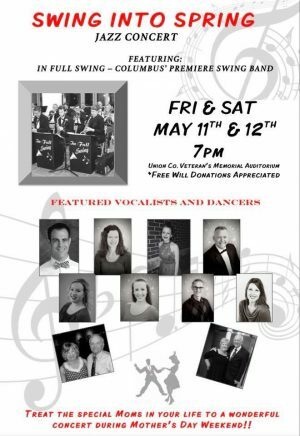 The In Full Swing big band is presenting a two-night “Swing Into Spring!” concert with the help of vocalists from The Singsations and dancers at the Union County Veteran’s Memorial Auditorium in Marysville on both Friday, May 11th and Saturday, May 12th at 7pm. Admission is free, but donations are appreciated – more details here. Crooner Brian Michael Smith and the John Vermeulen Octet present a “Sinatra & Friends” dinner and dancing event on Saturday, May 11th at 6:30pm at La Navona in Gahanna. Advance tickets are required – click here or call 614-532-5711 for reservations. Keep reading for Sunday celebrations and info on the return of a swing revival giant this week! There are five jazz brunches on Sunday, May 13th that we know of – the schedule kicks off at 11am with a Jazz Brunch at The Pelican Room Downtown (it runs until 4:30pm, more details here) as well as a performance by harpist Trista Hill at Asterisk Supper Club in Westerville. Two regular weekly brunches remain great options – guitarist Doug Neel plays the Market District Kitchen & Bar in Bexley at 11:30am, which is also when the Erik Augis Trio entertains at Third and Hollywood in Grandview – and guitarist Jeff McCargish kicks off the Mother’s Day Celebration at Barcelona at Noon. Pianist and vocalist Vernon Hairston will serenade mothers at Family Affair Cafe in Groveport at 3pm, near where Alex Schrock and Bradley Mellen will play duo at BrewDog DogTap in Canal Winchester at 4pm. The Jerry Powell Band celebrates “Mother’s Day at the Jazz Ballroom” at The Social Club Lounge on the East Side at 6pm (more details here). Also at 6pm, the Bobby Floyd Showcase welcomes vocalist and new mother Laura Camara for a special featured set (tickets available here. And another weekly event that will be honoring moms is NiNi Love JazzySide at The Savoy Club on the East Side at 7:30pm CANCELED. Celebrate the moms in your life with great live jazz! Thursday, May 17th (7 – 9pm): Squirrel Nut Zippers with Whirlybirds at Skully’s, Short North. One of the leaders of the 90’s swing revival is back! North Carolina’s Squirrel Nut Zippers have a new album, Beasts of Burgundy, and are spreading the word with a tour. Opening up this event is Columbus’ own Whirlybirds, adding to the swingin’ merriment with their own catalog of tasty originals and timeless standards. Tickets are going fast, so get them here now!